Research has shown that a child’s first three years are a very important time for development and learning. Getting early intervention services now will help improve your child’s ability to develop, learn and play, and will assist you to help your child and family in ways that are important to you. This section will introduce you to the planning process for developmental services for your child and orient you to the supports and services available to your family through the Early Intervention program. Montana’s early intervention system will ensure that all families have equal access to a coordinated program of comprehensive supports and services. This means that the staff within the system will work closely with you to provide the kinds of supports that make the most sense based on your family’s priorities and your child’s needs. These were recorded during your child’s evaluation, and they will be updated during your family’s involvement with early intervention. The Individualized Family Service Plan, or IFSP, is your child’s written plan for early intervention services. It shows how you and your early intervention team will work together to address the needs you identify for your child and family. 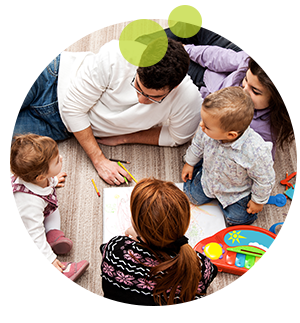 The IFSP is family-centered. This means you will be an active team member and a key decision maker throughout the IFSP process. The IFSP is based on information from your child’s evaluation and from the concerns, resources, and priorities that you identify. It will list the services your child needs to develop and learn, and the services your family needs to support your child’s development. Also, it will list the duties of everyone involved. Some of the help you receive may come from your own family and friends, while specialists may provide other services. A Family Support Specialist, your service coordinator, is responsible for explaining the IFSP process to you. He or she will make sure the IFSP is written accurately and clearly and will answer any questions you have. Your signature on the IFSP shows your participation and your agreement with the plan. However, if you disagree with all or part of the IFSP, you have the right to share your concerns and ask for changes. You may accept or refuse any or all services recommended to you. Once a service begins, you may stop that service any time you wish. A copy of the IFSP must be given to you after it is completed and signed. The written IFSP is reviewed at least every six months. It is also updated at least once a year. Your needs and resources may change, so more frequent reviews can be held to make changes as needed.